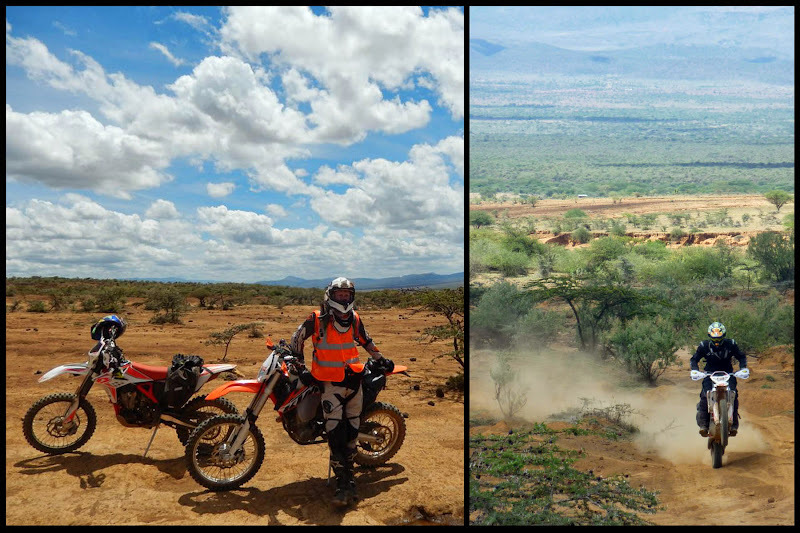 In December, I sold my XR400 and left Dar es Salaam for Nairobi. First thing I did: Buy myself a 2014 KTM 450 EXC. 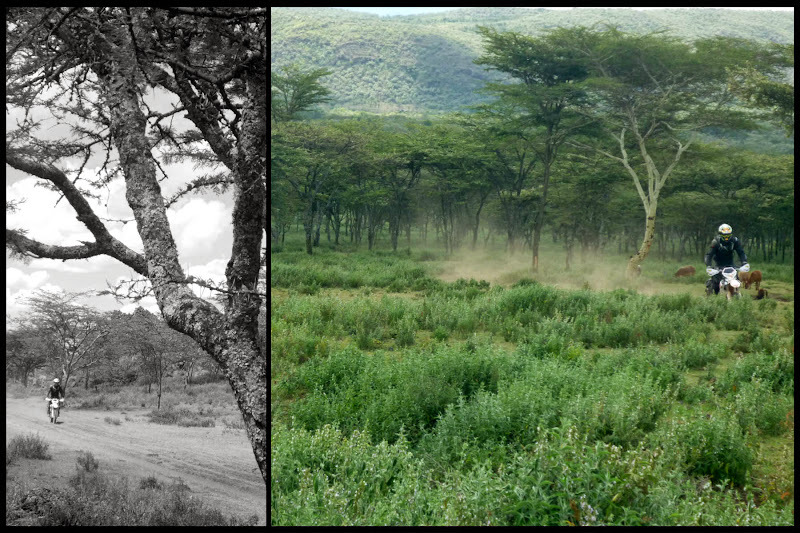 Since then, I’ve just been dying to get out into the Kenyan countryside. 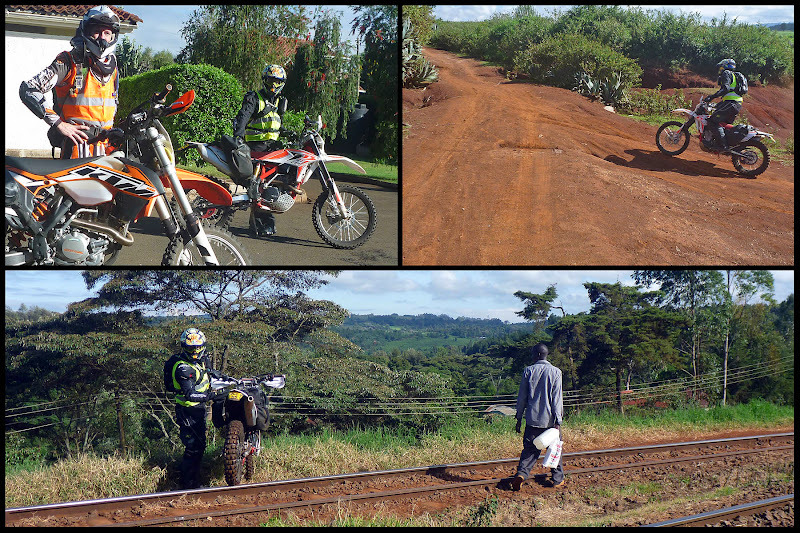 By chance, fellow rider Atreyou had also just moved to Nairobi from Tanzania and had bought a Beta. We finally found a free Sunday and made an excellent day of it. We threw the plan together quickly. I got on Google Earth and marked out a rough plan to head to Mt. Suswa. 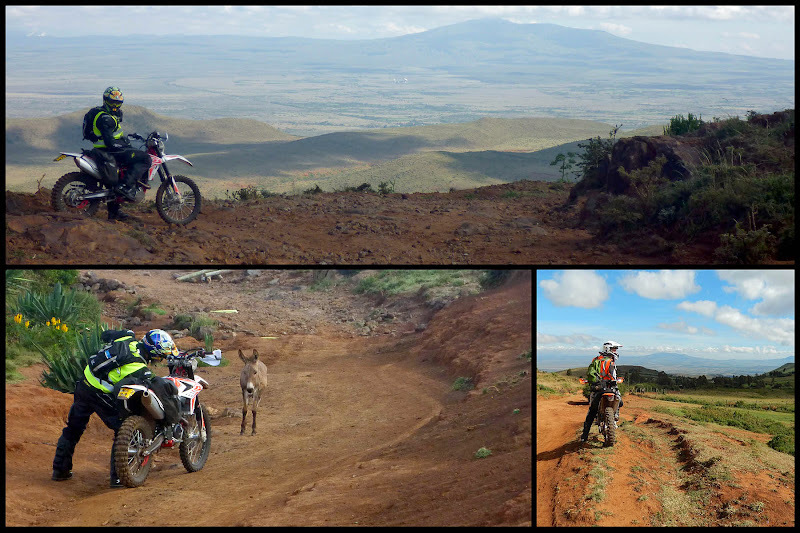 The ambitious goal was to ride off-road down the escarpment and circumnavigate Mt. 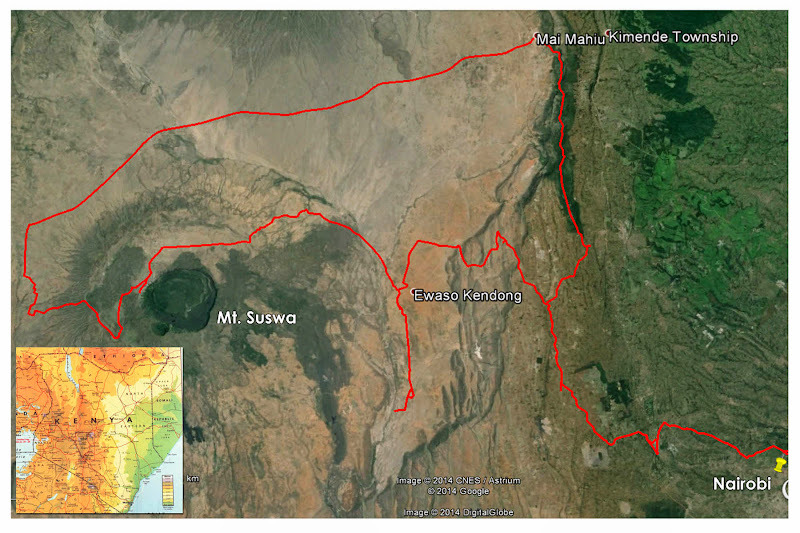 Suswa to where an Enduro race was being held on the northern flank. 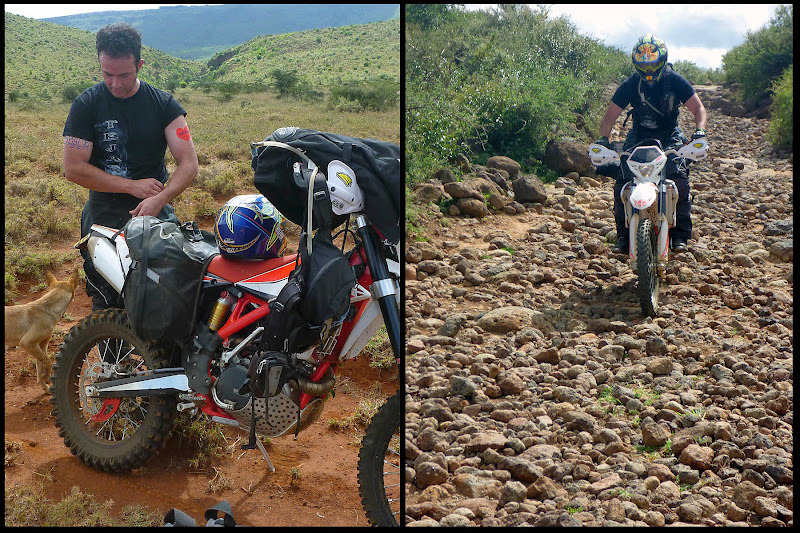 We didn’t make it, but we covered over 200 km off road on dusty tracks and horribly rocky goat paths. It was fabulous. Right away, our proposed route was complicated by the Southern Bypass’s construction. What will one day improve traffic in the city (we vainly hope) was smack-dab in the middle of the way of our Sunday ride. I had a waypoint plotted that would have involved climbing up a vertical 2 storey cut made by the excavators near Kikuyu town. In the process of sorting out a workaround, we ended up on a railroad track that had to be crossed before connecting to the dirt roads that would lead us to the escarpment’s edge. The highlands around Kikuyu were beautiful in the morning, planted corner to corner with maize and lazy in the cool light of early day. We easily navigated through villages and past cattle pens to the edge of the escarpment where Mt. Suswa loomed above the plains below. A brief aside: The bright orange and yellow vests are not our idea of a fashion statement, by the way. Kenyan bikers are required to wear them, and to avoid doing so is the quickest way to court the attention of the boys in blue, so until we were out of town we complied, begrudgingly. At least mine is orange! The descent to the plains was brilliant. It was our first taste of what the day had to offer with rocks strewn from edge to edge on the rarely used road etched out of the hillside. It was narrow enough that at one point we had to pause to let a donkey cart laden with logs find a place to pull off so we could pass. By the time we reached the bottom, our forearms were like stones from holding the grips, but the bikes handled it brilliantly. I would have felt like a whale coming down that road on my XR. Oh, how I love that EXC! Though rough, we were both enjoying the challenge of the road, so I ignored my GPS and we went all the way to the valley floor instead of turning off at a junction that I’d spotted on Google Earth. 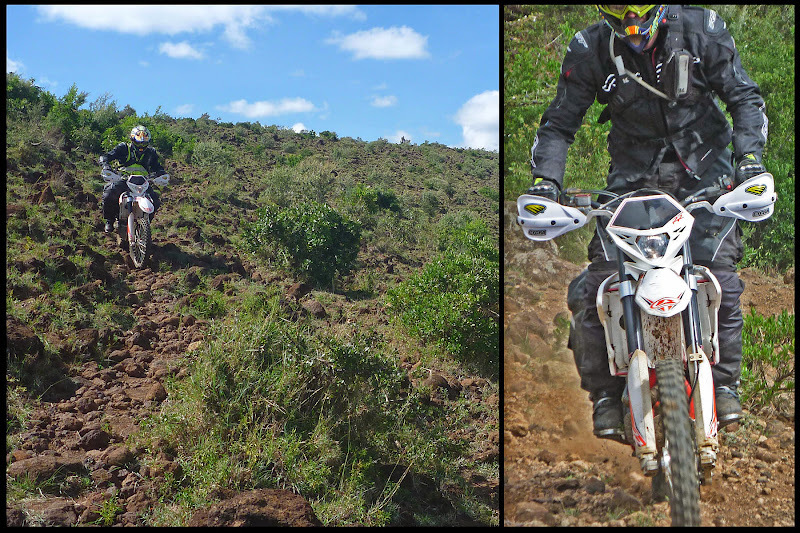 It was a decision that would lead to the toughest section of the day. The bottom of the road dead-ended into a stone quarry (fittingly enough) and only the shadows of cattle paths extended roughly in the direction we wanted to go. With no option, I picked one that clawed its way up a hill over thousands of loose stones; they were like Goliath’s marbles discarded in our way. 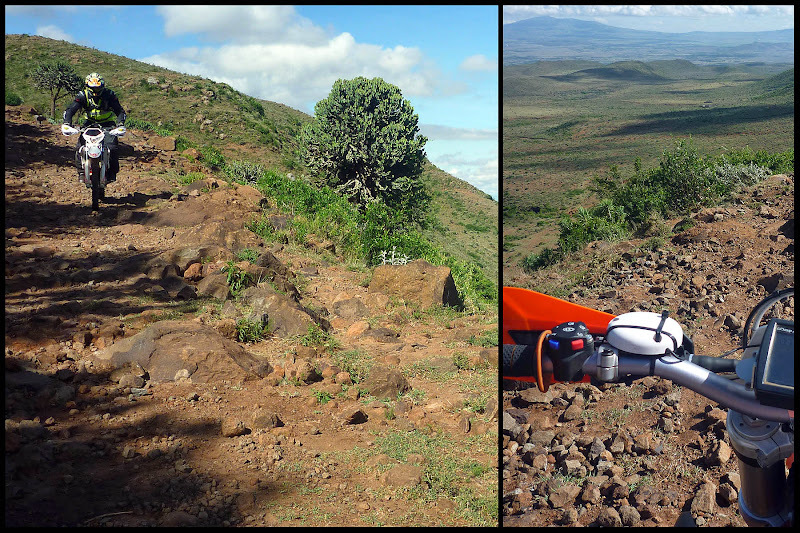 Our handling of the section was less than polished, but we hammered our way up and down the hill without incident. Everywhere there were stones and thorns, stones and thorns… and only then did I remember I had not yet fitted a sump protector or proper hand guards (yes, those cute little orange things are the ones that come with the bike and are obviously meant to be discarded… like the horn and kickstand probably) nor did we have heavy-duty tubes in our tyres. On the other side of a tricky dry gully, through whistle thorn trees and wicked, head-high acacias, we managed to rejoin the track I’d made. Atreyou took this opportunity to shed the hot, black, heavy jacket he’d been wearing after I noticed sweat literally dripping out of his sleeve. Afterwards he looked like a snail without his shell and we both cringed to think about him taking a spill in those stones and thorns. A few cattle herders approached (as a default, in every photo in this report which pictures us stopped, you can imagine a small band of kids or Masai standing around watching, some with dogs, some without, but always there, watching, staring, waiting) and pointed us down the track. It’s always nice to have confirmation (even if it’s wrong), and we blasted out along what was an old access road to a mostly dry dirt bund reservoir. 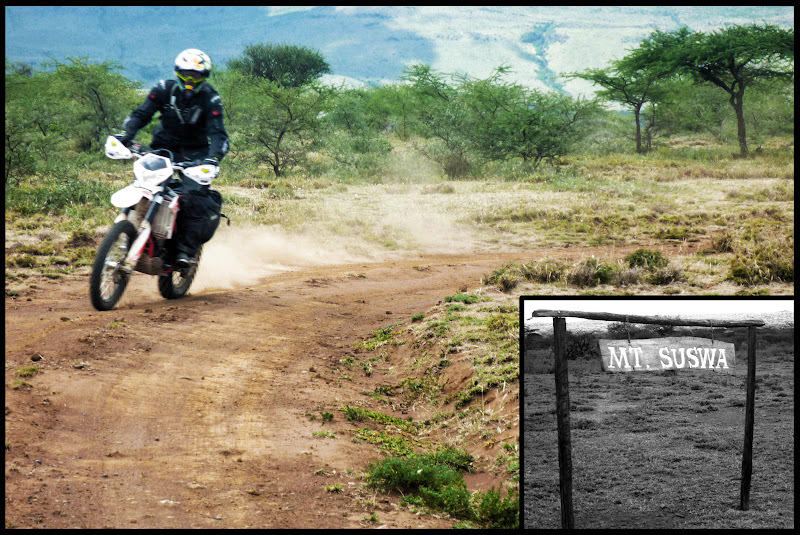 The road was biker heaven: mixed dirt/sand and sections of pure stones. So varied you never got bored. 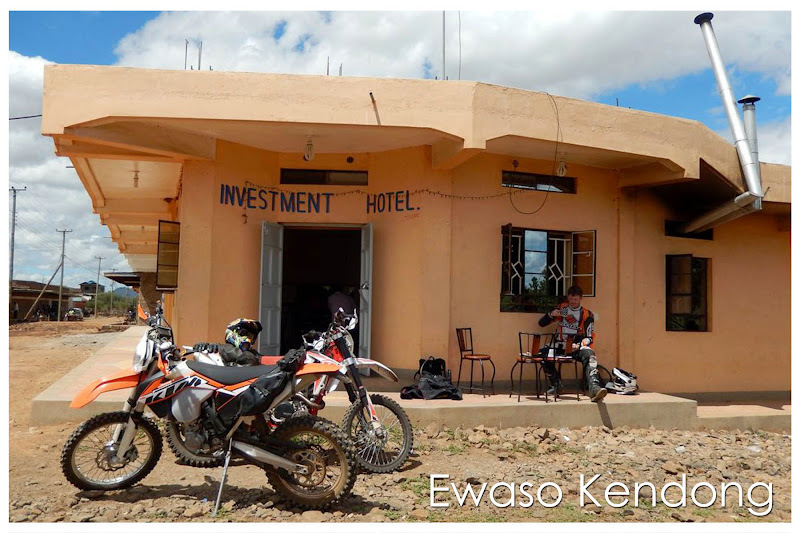 The track was fast and open for a good stretch, and we just flew along until we reached our planned breakfast stop: Ewaso Kendong. We hadn’t even waded into this little one-horse trading town before being immediately drawn to the Investment Hotel and its promise of hot, milky, sweet tea and an assortment of fried breads. I chose the mandazi (wise move) and Atreyou choked down a dry-as-dust piece of something-like-marble cake. Spirits were high, but we were already pushing 11:00 when the guys with the jerry cans came to fill up our tanks and we had a long way to go. Fuelled up, we decided to attempt the southern route around the mountain, knowing it was the least likely to be successful and get us to the Enduro. We blasted off on a fast dirt road filled with dust pots and fesh-fesh to little more than a cattle path that branched off into the bush. After following that awhile, we were confronted with another stone minefield and a bluff on the other side out of Monument Valley Utah with slim prospects for success, so we reluctantly abandoned the plan and decided to go back around the mountain to the north. In retrospect, I’m so glad we did. Backtracking through Ewaso Kendong, we proceeded North awhile. I had etched out a couple of possible routes onto Mt. 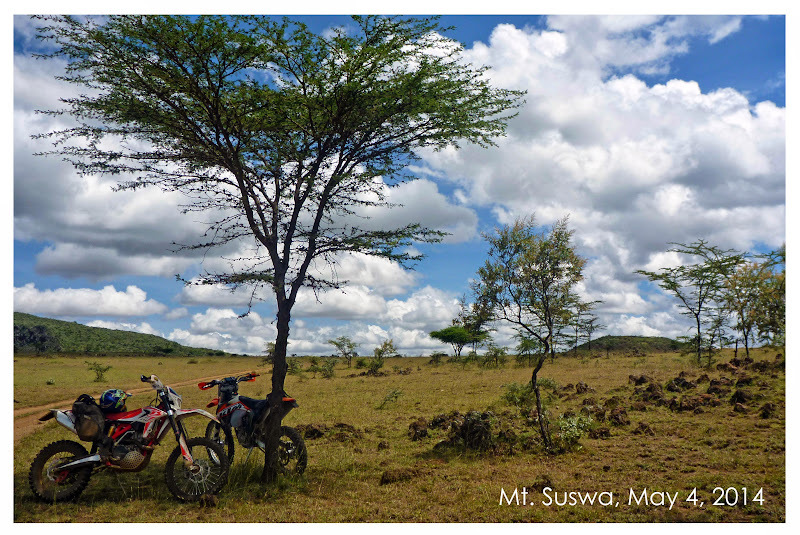 Suswa itself, but figured we wouldn’t be able to ride there because it’s a conservation area… but this is Africa. We decided to at least ride to the entrance, and when we found nobody manning the gate, we invited ourselves in. The flank of the mountain was hard-pan clay with almost no vegetation in spots. There were patches of extreme erosion and others that appeared still to be remnants of lava flows coursing down the slope. 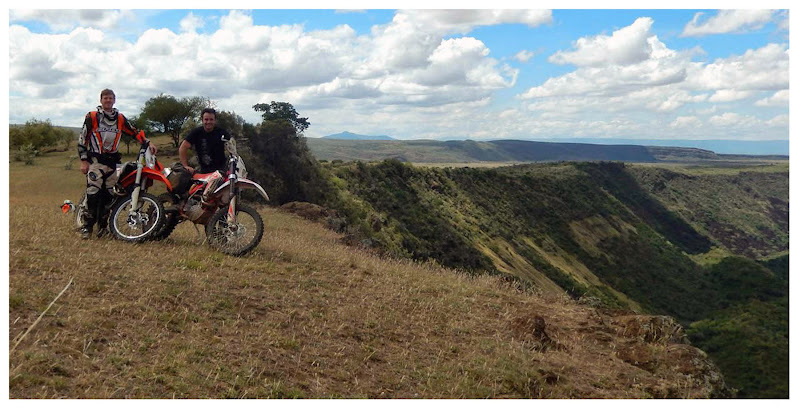 It was a great climb leading to a lush plateau between the outer ring and the inner crater of the volcano. 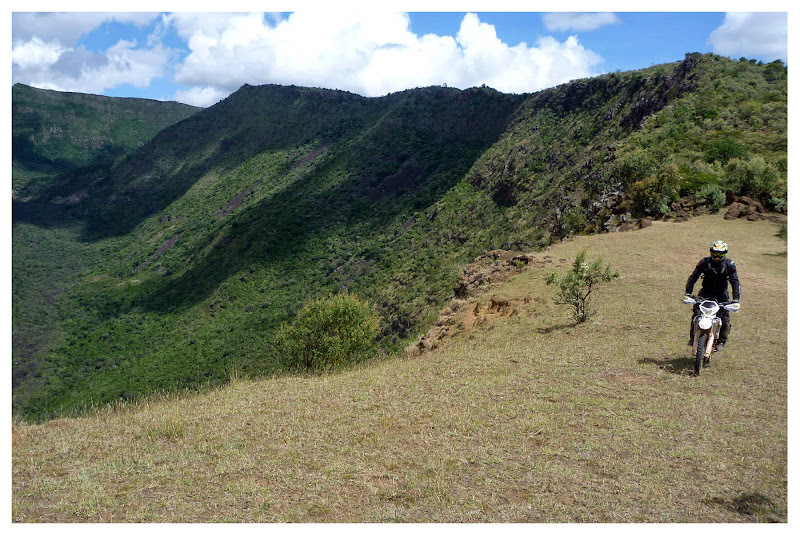 Atop the mountain, Masai manyattas and thorn fences lay like a patchwork across the landscape protected by the high outer rim that arced around like an abandoned and partly breached defensive wall. Tracks were smooth and fast and the air was cool and we were within 500 meters of the viewpoint into the crater when I met a 4x4 and a guide who collected the entry fee we hadn’t paid at the gate below (Which was fine with us, by the way. You gots to pay to play). Atreyou, who “was just behind me a minute ago”, had mysteriously not appeared after several minutes, so turned back to investigate, hoping against hope he was just taking a photo or something. Alas after a corner or two, I find him dusty from ears to ankles, praising the strength of the bike, but lamenting what appeared to be a very badly messed up thumb. The nail was purple and the thing was obscenely swollen. Not the best thing that could have happened at the furthest point from home, but there you have it: Murphey’s Law in action. Undaunted, or maybe just a little daunted, and being the rugged, hardy biker he is (and also having no other option), Atreyou pushed through the pain and we rode on to the lip of the crater to take in the sights. Unsurprisingly, the view was spectacular. We didn’t rest long. It was the perfect place for some grub (which we didn’t have) and an hour’s contemplation, but with a potentially broken thumb getting fatter by the minute, and the sun well past her zenith, we decided to get rolling. The options were: a) Return the way we came in or b) see if the other track I’d made that left the crater via the West end was rideable. Naturally, we went for the unknown option. Though rutted and rough in spots, the western exit was every bit as spectacular as the other side as it followed the outer rim of the crater affording long, hazy views of the plains below. I was loving it, but Atreyou had slowed his pace noticeably, being forced to twist the throttle sans the appendage that arguably separates us most significantly from sea cucumbers, toadstools and the like. After about 45 minutes of lovely views and scrappy dirt roads, we emerged onto the dreaded slab. As tarmac goes in Kenya, admittedly, the Narok road is pretty amazing… no potholes, no speed bumps, painted lane dividers and edge markings etc. But, since it was packed with trucks, busses and 4x4s, so it was loathsome all the same. 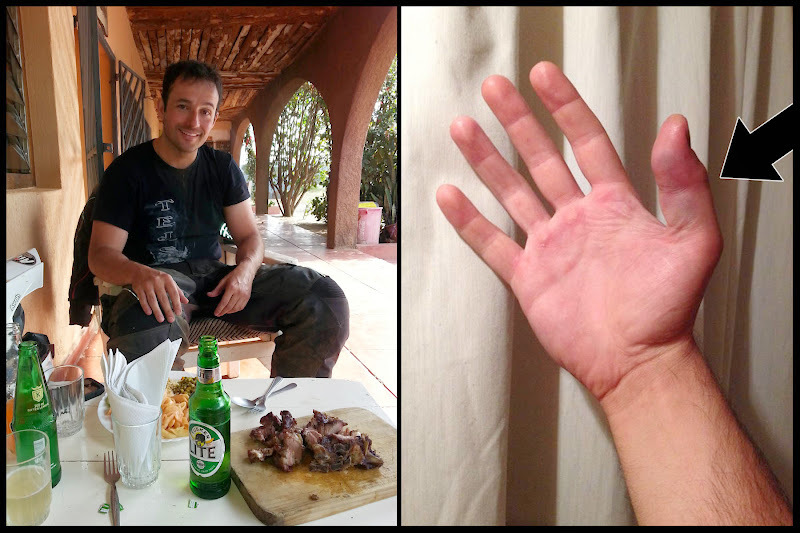 Due to the state of “the thumb” we determined the best plan was to belt it to Mai Mahiu, slaloming through the cages, where we were sure to find nyama choma and cold beverages to strengthen our resolve and push us the last 30 km home. Sat upon our sore assets, we pressed on. After our late lunch, we climbed the Old Naivasha road out of the valley and retraced our steps on the dirt backroads to Loresho. All told, an amazing day. I can’t wait to ride my KTM again soon. Atreyou, how’s the thumb? I have lurked awhile, but this isn't technically the first RR I've written to be put on Wild Dog. My "friend" (if you can call an abusive, foul-mouthed, shirtless, sweaty, beer-bellied grumpy old man "friend") steveindar posted several of our TZ based trips HERE. From now on, I'll make sure to include trips on the Wild Dog Forum directly so you don't have to go sneaking into ADV if you don't want to. Page created in 0.287 seconds with 28 queries.